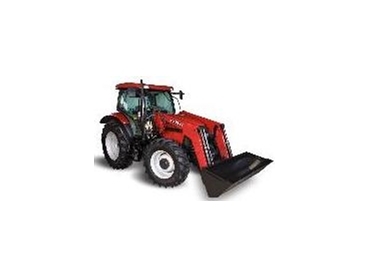 Case IH will officially launch the Prime-Lift and Vision-Lift front end loader ranges. The new front end loader ranges will offer advanced features including a well-designed loader self-levelling system that significantly increases visibility. The new ranges are the entry level Prime-Lift and the premium Vision-Lift loaders. The Vision-Lift range includes an exclusive front-end loader levelling system with an innovative internal self levelling linkage enclosed inside the loader boom. This gives the loader a better appearance and gains between 240mm and 260mm of increased vision. Case IH have also concealed hydraulic distribution lines inside the front end loader boom arm, which increases loader to tractor clearances and provides boom arm surfaces free from hoses, brackets and other components, further enhancing the visibility offered by these machines. The range also features standard third and optional fourth service for use with attachments such as 4-in-1 buckets and silage attachments, and a new easy-attach and detach feature. The patent-pending Auto Cam Lock & Fast Lock frame stand system makes it quicker and easier to detach and reattach the front end loader to the tractor. There are no components that have to come away from the loader as the automatic locking features are all built into the design, and reattaching the loader is a quick, automated process. Once the hydraulic hoses have been connected, the operator can completely attach and secure the loader without even leaving the tractor seat. The Prime Lift series offers two models, with lift heights of 3.2m and 3.5m. The Vision Lift series will include six models ranging from 3.3m lift height to 4.8m lift height. Stuart Brown, Case IH Marketing Manager says the whole range has been designed for strength, ease of operation and safety. The machines feature enhanced engineering strength and visibility, and simple to use quick coupler and multi-coupler options. All of the features have been created to make the users’ job simpler and more productive.